Since thousands of years it has been prophecied that Satan or the Antichrist will arrive at the End Of Times to deceive all the Nations of the world. From the prophecies we have read that he will be an intelligent and wellspoken man ready to deceive as many people as possible. He will come to power at the End Of Times when the whole world will shout ”Peace” and when everyone accepts a One-World ruler. 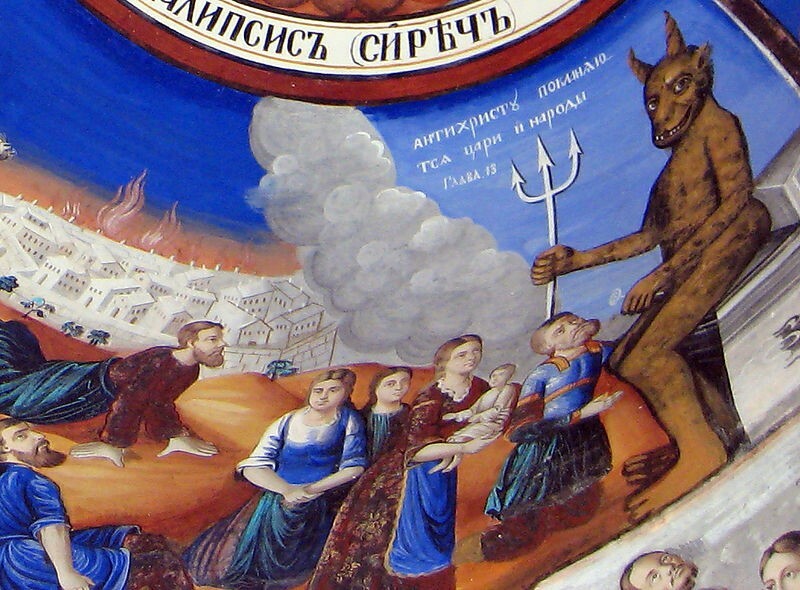 Here we look at some ancient prophecies about the Antichrist and compare with today´s world leaders. 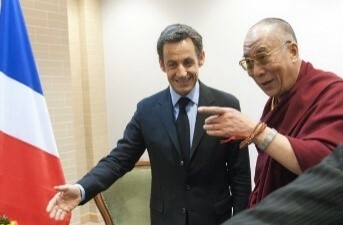 Dalai meets British, US and French leaders. There is only one person who has free access to at all Heads of State across the world since several decades. Politicians change but Dalai Lama continues to visit new Heads Of State. Is this a coincidence? Top-Bottom: Dalai lives in India. Dalai preaches in Japan, 31 years old. 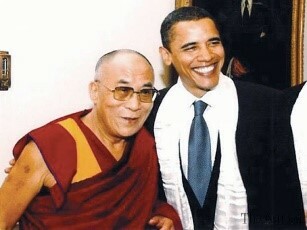 We know that Dalai Lama lives in India and we know that he started preaching abroad when he was 31 years old. Since then he has been preaching around the world for around 50 years. 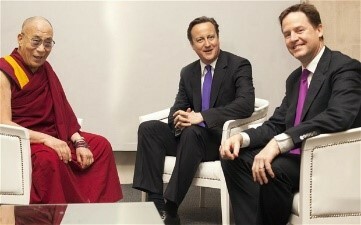 Dalai Lama with the Bishop of London. Dalai Lama is not only immensely popular among the leading western politicians but also among other religions, ie Christian priests. This is a perfect match according to prophecy. Why did a priest from a remote area in China with a very small population become so powerful and popular across the whole world, even with other religions? And there are very few practitioners of his religion in the west too. 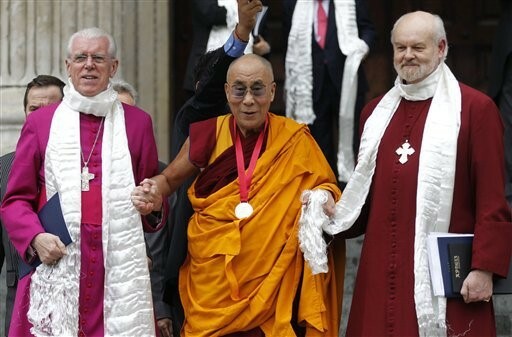 Will Christian priests, Jewish Rabbis and Buddhist abbots form a world religion under Dalai Lama? Dalai Lama has an absolute belief in the Kalachakra prophecy which was presented by Buddha Shakyamuni around 2500 years ago. Since 1951 Dalai Lama has held Kalachakra initiations for around two million people around the world and charging westerners a lot of money to be able to participate in his ceremonies. ”From henceforth I am your [deity] Vajrapani. You must do what I tell you to do. You should not deride me, and if you do, not forsaking fright, the time of death will come, and you will fall into hell” (Dalai Lama XIV, 1985, p. 242). Why is Dalai Lama talking about becoming people´s deity? Why does he think about himself as people´s God? Why does he threaten disobedient people with going to hell? This is the final battle between good and evil, the battle beteen the true Buddhists and the Barbarians. Good will overcome evil. The King of Kings is called Raudra Chakrin and he comes from his perfect Kingdom called Shambhala(”Land of Bliss”). Raudra Chakrin will appear during the epoch of ”Non-Dharma” when the people…have become egotistic and materialistic. In the Kalachakra prophecy, ”Krinmati”, the ”King of Delhi”, will declare himself Mahdi – the ”supreme enlightened being”. ”Krinmati” in Sanskrit also means ”The Destruction-minded One.” This is the ”Demon King” of the World. Since Dalai Lama acts as the supreme master of the Kalachakra Tantra we need to ask: Which part does he try to play in the prophecy? Kala means time, destruction and death. Chakra means wheel. So Kalachakra can be translated as ”wheel of time” or ”wheel of destruction/death”. Dalai Lama refers to himself as ”God-King” and ”His Holiness.” Just like the Demon King does in the prophecy when he appoints himself the ”supreme being”. 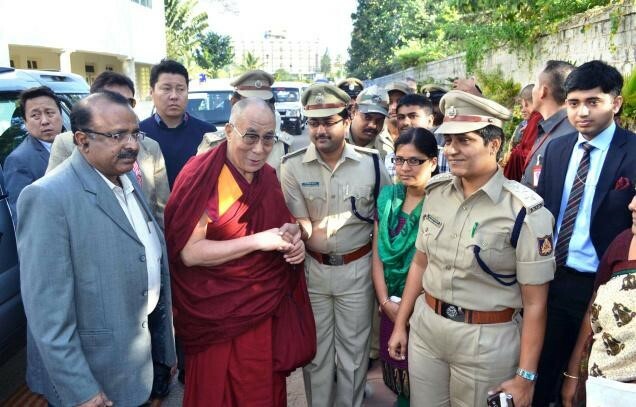 Dalai Lama is of non-Indian descent and he lives in India. A perfect match for the Demon King ”Krinmati”. These statements fit the Antichrist perfectly. 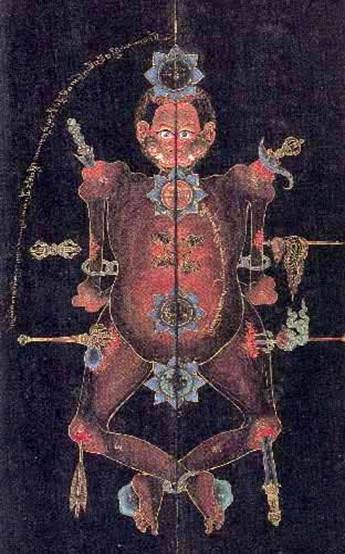 Tibetan lamaism has a great focus on black magic. 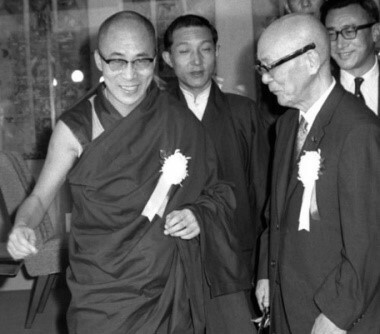 Dalai Lama boasted about his occult powers when Mao Zedong died in 1976. During a Kalachakra ritual he staged a rite connected to the Kalachakra Tantra. ”Jerusalem, 20 February 2006 (By Matthew Wagner, The Jerusalem Post) – Chief Rabbi Yonah Metzger called on Sunday for the establishment of ‘a religious United Nations’ representing the religious leaders of all the countries in the world. 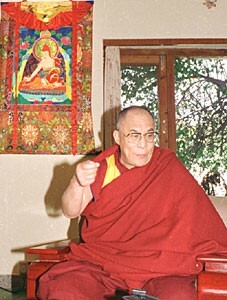 Metzger suggested establishing the religious UN in Jerusalem and placing the Dalai Lama at its head. As we can see the plan to put Dalai Lama as the Head Of A World Religion in Jerusalem is already in full swing. Pope Francis has already earlier given his support to the United Religions and now we only wait for the green light from the Vatican. Antichrist took the riches of the world to Jerusalem – as we have mentioned before Jerusalem in prophecy means China and we all know how rich China is today with all the industry moving there. 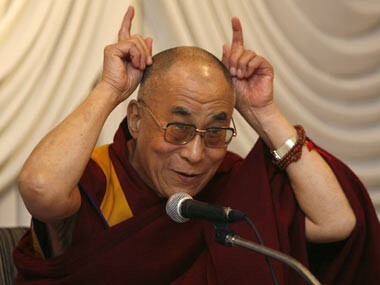 While we can not prove that Dalai Lama is the Antichrist we notice that Dalai has many similarities with the Antichrist of the Christian prophecies and the Demon King of the Buddhist Prophecy. He seems to make every nation except China and perhaps Russia bow down to him. He is even accepted by the top jewish rabbis as their religious leader to be placed in Jerusalem – which is exactly in line with prophecies. What is the real history of Tibet, this mysterious country? We will try to show you these facts in part 2 of this article.